At the Third Smarter Sustainability Reporting conference this week in London (more about that to come on the CSR Reporting Blog), we were privileged to hear from Erinch Sahan, Policy Advisor, Private Sector, Oxfam GB about the updated Behind the Brands Scorecard, released today, 26th February. Erinch gave a passionate, informative and entertaining overview of the work he and his team have been leading at Oxfam. Sort of a Behind the Scenes at Behind the Brands. As you may know, Behind the Brands is part of Oxfam’s GROW campaign to help create a world where everyone has enough to eat. Oxfam says that while the food system is complex and its problems multi-faceted, we know that the world’s largest food and beverage companies have enormous influence. Their policies drive how food is produced, the way resources are used and the extent to which the benefits trickle down to the marginalized millions at the bottom of their supply chains. The Behind the Brands Scorecard assesses the agricultural sourcing policies of the world's 10 largest food and beverage companies. It exclusively focuses on publicly available information that relates to the policies of these companies on their sourcing of agricultural commodities from developing countries. Companies selected are those with the largest overall revenues globally, and are included in the Forbes 2000 annual ranking, which measures companies on the basis of composite sales, assets, profits and market value. The intent is to provide stakeholders with information about the brands they engage with, and also urge them to take action to drive these companies to do more to address issues in their supply chains. The work of the Oxfam team started with an initial assessment a year ago, and during that time there have been significant instances of engagement with the companies in the Behind the Brands scorecard and several achievements can be noted. For example, on issues relating to lack of gender ineqality in chocolate supply chains, Mars, Nestle and Mondelez all committed to investigating barriers to women and making plans to address these, as well as signing the UN Women's Empowerment Principles. Similarly, in focusing on the issue of land acquisition, Oxfam was able to drive change. Since this campaign, which urged companies to establish and implement a zero tolerance policy on land grabbing, including adherence to the principle of FPIC (free prior and informed consent) in the operations of the company and its suppliers, Coca-Cola announced a set of industry-leading commitments to protect the land rights of farmers and communities in the world’s top sugarcane-producing regions. Other major companies have followed suit with declarations of policy and new action in this area. Behind the Brands, therefore, is not only a review of policy but a powerful tool to drive change through transparency, engagement and focus. 1. We chose policies that link to processes that would be harder to disclose without changing behavior. 2. Tracking policy also allows others to hold companies to account. Once there is a public commitment from global companies to do something, local efforts to improve practices on the ground have greater legitimacy and influence. 3. Most importantly, most of the indicators require companies to be more engaged in their supply chains collect information on the issues and often, conduct joint projects with suppliers and stakeholders to address issues and have the right requirements in supplier codes and guidelines. In our experience, these correlate strongly with the companies who are doing more on the ground. After hearing about the massive progress that has been made in issues largely ignored in most of the Sustainability Reports of large food companies to date, I am tending to believe that Behind the Brands is indeed an effective tool to drive performance change, proving one of my long-time mantras: transparency (and reporting) is a catalyst for performance improvement. Erinch was kind enough to send me some further information explaining the updated Behind the Brands Scorecard. Here are his words, a sort of rare "guest post" on the CSR Reporting Blog. It’s a year since we launched our scorecard. Having clawed through company reports, analyzing every commitment and policy of the world’s 10 largest food and drinks companies (‘the Big 10’), we scored companies on a range of issues impacting the lives of people living in poverty around the world. A year later, having rigorously updated the scorecard, we reflect on how companies are tracking on the seven issues we cover: workers, farmers, women, land, climate, water and transparency. The companies are on the right track. All but General Mills have improved their overall scores since February 2013. The top three (Nestle, Unilever and Coca-Cola) separated themselves further from the pack and saw the biggest jump in scores with overall increases of 10 percent, 14 percent and 13 percent. The companies in the middle of the pack (Danone, Mars, Mondelez and PepsiCo) saw mild improvements. There were some improvements also at the bottom of the scorecard. Associated British Foods and Kellogg’s - previously ranked 10th and 8th respectively - saw increases in scores of 7 and 6 percent respectively. As a result, General Mills is now at the bottom of the rankings. A year ago, no company could be classified as having “good” policies on any issue (scoring 8 or above out of 10). There are now two that achieve this feat. Unilever, with its score of 8 for farmers, has shown true leadership in pursuing supply chains that are inclusive and fair for smallholder farmers. Nestle (scoring 8 on climate) continues to lead all companies on climate, where we assess both efforts to reduce emissions and to help farmers adapt to a changing climate. In both cases, the results mirror broader assessments of these companies. The Carbon Disclosure Project’s Leadership Index puts Nestle first among its peers, and Unilever is widely recognized for its work on dealing more fairly and inclusively with smallholder farmers. A year ago, it was clear that the industry was failing on two key issues: how it addresses women’s inequality and land rights. Scores were woeful and none of the Big 10 had an approach that addressed the plight of women working on farms around the world and none were making suppliers respect the rights of communities over land. In response, we spent the last year reminding companies about these blind-spots, asking supporters (nearly 400,000 supporters spoke up), investors (representing billions of dollars asked the companies to act) and civil society to join us in urging the Big 10 to start addressing gender and land issues. While we saw impressive improvements on women’s rights, land and climate change, we didn't see the same level of movement in the workers, farmers and water themes. On these themes, (apart from Coca Cola on water), no company showed significant improvements. On water and workers issues, companies had already picked off the ‘low hanging fruit’ and taken some steps to strengthen their commitments. For instance, a year ago, most companies had already recognized the International Labor Organization’s labor rights conventions and were disclosing key water information through the Climate Disclosure Program’s Water Program. But a year later, still only PepsiCo recognizes the UN Human Right to Water and no company has set a specific target to reduce its water use along its whole supply chain. On farmers, only four companies (Danone, General Mills Nestle and Unilever), mildly improved their performance over the course of the year. Most continue to ignore the importance of ensuring dealings with farmers are fair and inclusive (e.g. through transparent contracts and ensuring farmers are paid fairly). The updated scorecard now also assesses a critical new component of transparency – taxes – focusing on whether companies disclose information linked to the use of tax havens. New indicators on transparency now ensure that we better capture this important theme. People and corporations using tax havens are depriving the world of more than $150 billion in lost revenue, enough money to end extreme poverty twice over. Through our new tax indicators Oxfam aims to identify which companies are most open and accountable in their tax dealings. With the exception of Unilever and Coca-Cola, all the companies fail miserably in tax disclosure. 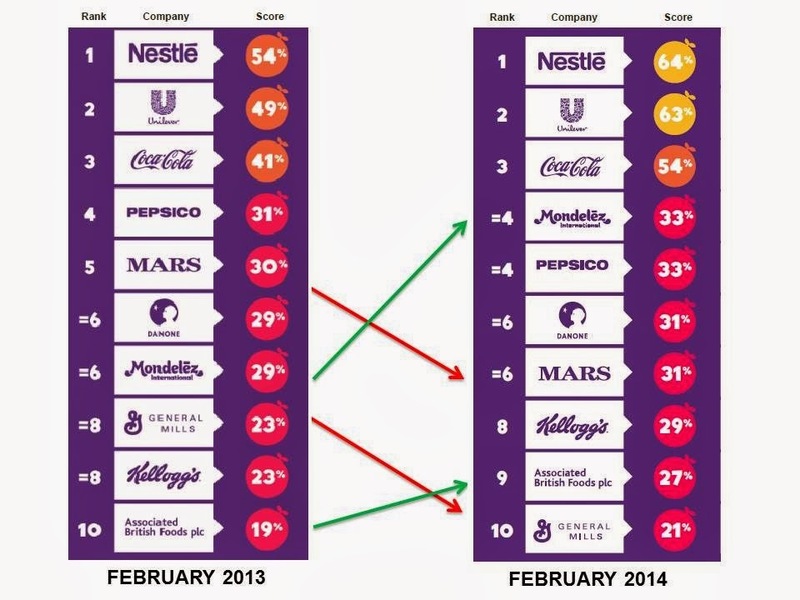 This helped drag the transparency scores of four companies down by 1 point, with only Unilever slightly improving its overall transparency score over the course of the year. Addressing sustainability comes at a cost. In many circumstances it may seem to cost more in the short term to grow ingredients in a way that respects rights, pays farmers and workers fair prices and wages, and protects the planet. But the farmers who grow the ingredients capture a tiny amount of the value of the prices paid by consumers, with cocoa farmers receiving as low as 3.5 per cent of the price of a chocolate bar, coffee growers receiving as little as 7 per cent of the price of coffee in supermarkets and tea farmers getting as little as 1 per cent of the price of tea. With so little of the final price going to the farmers, ensuring farmers get a fairer and more sustainable price for their producer won’t necessarily require consumers to pay. It can be covered by a marginal shift in how value and profits are shared between farmers and the rest of the food system. For company commitments to be more meaningful, there needs to be an assurance of their intention to pay the price for fair and sustainable production. Emerging issues like land and women’s rights are rising up the agenda. Rights is the ‘new black’ in sustainability and recognizing and respecting rights should be core business for any company. However, ‘voice’ is quickly joining the rights agenda as the ‘next black’. Giving marginalized people a say over their lives (like on land rights where 5 of the ‘Big 10’ are giving communities the right to free, prior and informed consent) is critical. Whether it’s workers having a say in their working conditions through collective bargaining, farmers able to control their destiny through producer organizations or women able to raise concerns via women’s organizations, there are many ways the ‘Big 10’ can use their immense power to give people with little power a real voice. Climate change is already having a terrible impact on the lives of agricultural communities around the world. Extreme weather is also impacting the supply chains and operations of the Big 10. The Big 10 need to both reign in their own emissions (and those of their suppliers) whilst also helping farmers adapt to a changing climate. More broadly, the planet needs their powerful voice needs to get behind broader action to tackle climate change. Oxfam will be increasingly speaking up on this issue. Behind the Brands seems to me to be doing great work. I guess we will be seeing more of these issues showing up in the Materiality Matrices of the Big 10 in their new G4 Sustainability Reports in coming years. Thanks to Erinch for great insights and for the guest post! And just in time, ahead of the start of the Smarter Sustainability Reporting Conference in London on Tuesday this week, a quick review of TUI Travel and the exciting world of sustainable tourism. TUI Travel plc is one of the world’s leading leisure travel companies, with over 240 brands in 180 countries and more than 30 million customers. With an aim to "make travel experiences special", TUI Travel employs 54,000 people in 31 key markets. TUI Travel is a seasoned sustainability reporter and has published five reports to date. The most recent is a GRI G3 Application Level C report and its a really interesting read. Apparently tourism accounts for 1 in 11 jobs globally, and 9% of global GDP, so this industry has a massive impact around the world. TUI outlines some groundbreaking work in the area of sustainable tourism. It's worth taking a look. I managed to get some perspectives from James Whittingham, Group Environment Manager, TUI Travel, who will speak at the Smarter Sustainability Reporting conference on the subject of carbon emissions reporting. James coordinates TUI Travel plc's work on reducing carbon impacts and other key environmental impacts and manages the delivery of the TUI Travel's 7 current carbon commitments that form TUI Travel's Sustainable Holidays Plan 2012-2014, and supports a wide range of activities including external environmental reporting. James has held the position of Group Environment Manager since the merger that created TUI Travel in September 2007 (bringing together the TUI Tourism businesses of TUI AG and First Choice Holidays plc). Before that, he was the Environment Manager for First Choice Holidays plc from 2004. Tell us about your professional background and how you came to be Group Environment Manager, TUI Travel. What specific experience prepared you for this role? James: I went on a 6-month secondment to First Choice Holidays in 2003 from an Environmental Consultancy – basically, I never left! TUI Travel was created from the merger of First Choice Holidays and the tourism businesses of TUI AG in 2007 and I went from being the Environment Manager for a company with 14,000 colleagues to the Group Environment Manager at a company with 50,000 colleagues. Consulting was a good foundation for getting a broad range of experience in different business segments – construction, aviation, healthcare and more. The diversity of TUI Travel means that today I could be working on supporting our Airline Environment Managers and tomorrow helping one of our Cruise businesses – variety is the spice of life and all that! What are your current priorities? And looking toward the next few years? James: To ensure we deliver as many of TUI Travel plc’s sustainability commitments called the Sustainable Holidays Plan by the end of this financial year, FY14 – year three of three. These commitments are arranged across four key “pillars”: carbon management, colleagues, customers and destinations and I tend to work primarily on carbon and destinations related commitments. These are three-year commitments [2012-2014] and they are scheduled to be delivered in a little over six months so I am supporting colleagues from around the business to deliver these and already looking at the next phase of SD strategy. In the next few years, the business will continue to focus on SD and I envisage we will be addressing carbon emissions, water, waste, biodiversity, supply chain and ongoing environmental improvements to destinations we take customers to as well as the source markets in which we operate. Tell us a little about the key trends you perceive in sustainable tourism and the most important environmental impacts that are important to travelers? James: There is a growing awareness among our customers about sustainability, such as the impact of carbon emissions from flying and the need to ensure that local people get a fair deal from tourism. Although these issues are not the major deciding factor for most people when they choose a holiday, it is in the interest of our destinations and the environment that it becomes a strong influencing factor. In several of our key source markets we have found a positive correlation between more sustainable holidays and customer satisfaction. We are encouraging holidaymakers to engage in sustainable tourism through our kids’ club activities, school education initiatives, customer donation schemes and sustainable tourism campaigns. How does TUI Travel differentiate itself in this space? James: It starts with our core values – Responsible Leadership is one of these 4 values and we try to use this as a guiding principle. As one of the world’s leading leisure travel organisations, we need to lead by example. For the first time, in our FY 2013 Annual Report, one of the “reasons to invest in TUI Travel” related to our approach to tackle SD risks and opportunities. 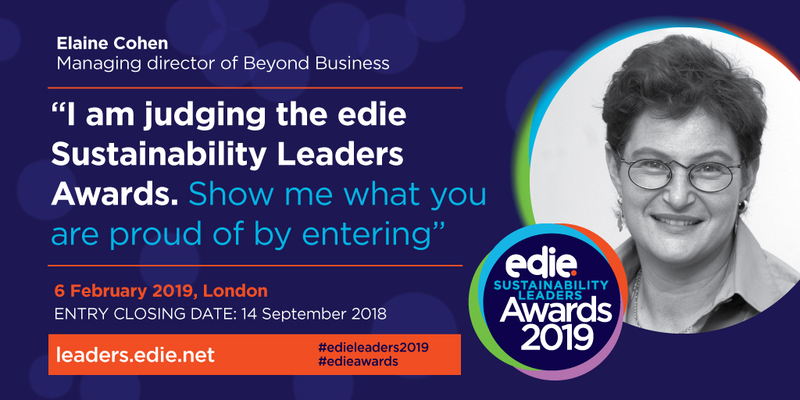 Sustainability is ingrained in our business culture, not just for our own future as a business but as industry leaders to set an example to the wider travel industry and beyond. What have been your key achievements in this area over the past few years? For the sixth consecutive year, TUI Travel was featured in CDP’s Climate Disclosure Leadership Index (CDLI) and was ranked in the top 10% of the FTSE 350 for our approach to carbon disclosure and governance. TUI Travel has been working with the Travel Foundation, a sustainable tourism charity, since it launched in 2003. We are the largest industry supporter and donor which over the last 10 years has trained more than 10,000 local people in skills to boost tourism, reduce environmental impacts and improve customer experience – and also trained 800 hotels to reduce energy, water and waste. We achieved our airline carbon reduction target of 9% (2008-2014) one year ahead of schedule with a reduction in our airlines’ per passenger carbon emissions of 3.2% year-on-year in 2012. Fritidsresor, our brand in Sweden, was ranked most sustainable travel company in Sweden in the 2013 Sustainable Brand Index. We are committed to sustainable development and to making a positive impact on society. We know leadership has to be earned and we never take it for granted. We celebrate local differences and actively seek to contribute to a better world. What are the most significant challenges for you in the sustainability reporting process? James: As a business located and operating in regions all over the world, we need to ensure we can appropriately capture the essence of what progress is being made – both in the context of an increasingly mandatory set of requirements (EU ETS, Carbon Reporting, etc.) as well as the breadth of disclosure encouraged and expected – e.g. CDP. As a core team, the Group SD Dept. has 4 people working full time on SD matters – the challenge is to get the balance between “doing” and “reporting” and supporting our 200 brands to make this happen through our network of SD managers across the business. And if I don't see you there, let's meet up on my next sustainable vacation. Here I am again in the UK, looking forward to the third annual Smarter Sustainability Reporting Conference (SSR '14) in London next week. We have a fabulous line-up of speakers again this time around, so if you haven't already booked your place, NOW is the opportunity. The conference will take place on 25th February and we will be discussing all things related to the evolution of sustainability reporting with some of the best experts and practitioners around. Check out my posts about presenters from Tiffany & Co, and from The Crown Estate. In preparation for the conference, I checked out Lloyds Banking Group's latest report. Lloyds Banking Group is a UK-headquartered financial services group providing banking and financial services to more than 30 million personal and corporate customers through brands including Lloyds TSB, Halifax, Bank of Scotland and Scottish Widows. Lloyds Banking Group has over 92,000 employees. With the financial services sector being the least trusted industry globally, according to Edelman's 2013 Trust Barometer, and with the UK down in the bottom third of the trust levels in the financial services league table, reporting becomes a critical tool to support business reputation, relationships, customer reach and employee engagement. Lloyds Banking Group (LBG)'s 2012 Responsible Business Report is structured around the Group's Responsible Business Strategy which was developed in 2011. It focuses on the contribution of LGB to greater prosperity in the UK. That's going to be even more of a challenge these days, following the devastating flooding in the south of the UK - just this month LBG announced a £250m fund to provide fee free lending for businesses and farmers, as part of a range of measures for businesses and individuals affected by the floods across Britain. The priorities for LBG are clear, and the report includes specific performance targets and results for 2012 and new targets for 2013. I was grateful for the opportunity to ask Caroline McCarthy-Stout, Head of Strategy & Reporting at LBG, a few questions. Caroline will be presenting on "Innovative ways to outline the progress of your responsible business activities" at SSR '14. Tell us about your professional background and how you came to be Head of Strategy & Reporting, Lloyds Banking Group. What specific experience prepared you for this role? Caroline: I’ve worked in the field of sustainability and public affairs for several years. I started my career working in retail, managing the environmental and social management programme for B&Q across their store estate. Prior to leaving to join their parent company Kingfisher in 2005, I headed up a Community Development team and developed an award-winning 5 year Community Regeneration Strategy which, at that time, supported the UK Government agenda. I was also instrumental in producing B&Q’s first CSR report. I then joined Kingfisher to help further develop its international CR activity and build a sustainability-related public affairs function. Prior to leaving Kingfisher early 2012, I was seconded to Business in the Community to help it shape its ‘Visioning the Future – Transforming Business’ programme - this included supporting business company members in picturing, planning and building sustainable business models. I have been involved in a number of networks and forums over the years, including Cambridge University Corporate Leaders Group on Climate Change, and chaired the CSR Experts' Group for the trade association Eurocommerce in Brussels. I was recognised as a Business in the Community ‘Game Changer’ in 2011 – an honour given to individuals who have changed business behaviour and advanced CR within their companies. I joined Lloyds Banking Group to lead Responsible Business (RB) reporting, investor indices and benchmarking work and help with the RB communications strategy. I participate in the RB Committee and have had a lead role in helping to shape the Responsible Business 2020 vision. What are current your priorities in role? And looking toward the next few years? Caroline: As part of our 2020 vision, we are launching a ‘Helping Britain Prosper Plan’ focused on the areas where the Group can make the biggest difference and where we can bring about change for the benefit of our customers colleagues and communities across the UK. Our Helping Britain Prosper Plan is simple but ambitious. It sets out seven key commitments and over 20 independently verified ’prosper metrics’ which cover the areas where we can make the biggest difference for our customers across households, businesses and communities. It directly supports our business strategy to be the best bank for customers. People across Britain are facing some big issues - a lack of affordable housing, the challenge of finding a job or escaping the problems associated with being financially excluded, planning for later life and the difficulties of starting or running a successful business in tough times. The Helping Britain Prosper Plan is our response to some of the issues we're best placed to help our customers tackle. Our Commitments include supporting more than 80,000 first time buyers in 2014, lending over £1bn to SME’s on a net basis in 2014, having 40 percent of senior roles filled by women by 2020 and donating at least £100m to the bank’s Foundations between now and 2020. A full set of commitments will be available in our 2013 Responsible Business report. We are the first bank to measure economic and social impact in this way and a big focus for us during 2014 will be to measure and report our progress and to continue to engage our colleagues to deliver against our Plan and bring it to life within our branches and across all brands. The reputation of the banking industry in general has suffered over the past few years. How do you view that and how does it affect your work? Caroline: I think it’s important to say that I would not have joined LBG if I didn’t believe in the leadership commitment to this agenda. There’s a heritage of ‘helping Britain to prosper’ spanning over 300 years and a culture within the business of wanting to do the right thing. We recognise our past mistakes, of course, and know we need to rebuild trust in our business – our Helping Britain Prosper Plan will demonstrate and measure the ways in which we are going to try and achieve this. We must be able to provide meaningful commitments and allow ourselves to be independently measured against those. I believe our Helping Britain Prosper Plan measures can help deliver a positive step-change in regaining positive public sentiment and trust in our industry. What are the most significant challenges for you in the reporting process? Caroline: Responding to the requirements of all of our many stakeholders and reporting against the things that they expect to hear from us and meeting our regulatory requirements without creating 100 page documents. Integrated reporting takes us a long way but stakeholder demands mean we have to find new, innovative and simple ways to communicate. We have an independent stakeholder panel and work with verifiers to ensure the issues we report upon are reflected in a balanced way. Who do you expect to be the main audience for your report? Caroline: The main audience has traditionally been the investment community. The analysts particularly use the report to profile the business. We've worked hard to ensure our reporting attracts other stakeholders and through our independent stakeholder panel, we’ve been able to get a better insight into what information people want to receive from us. We’ve also undertaken a comprehensive materiality review, and tried hard to find innovative ways of communicating both online and in summary format. How do you evaluate the effectiveness of your reporting process? Caroline: We evaluate hits on our website and we monitor the feedback we receive. Our stakeholder panel and wider focus groups, undertaken by them, enables us to understand the report’s effectiveness. Our report is also aligned to the Global Reporting Initiative (GRI) framework. Many organisations report on a yearly basis and then put it in the drawer for the next nine months. At Lloyds, the approach is very much a strategic one and the report needs to have multi-purposes as a management tool. For example, bringing our RB report forward in line with the Annual Report and Accounts not only supports an integrated approach, but also enables up to date information and data to be used to support key investment indices such as the Dow Jones Sustainability Index. This whole approach helps us to identify gaps and drive performance. We also believe in the importance of assurance and verification, giving readers the confidence that what is being reported is true and accurate. So, interesting perspectives and insights from Caroline. I am looking forward to asking her more questions next week and hope loads of CSR Reporting Blog readers will be there to do the same. In the meantime, thank you to Caroline for sharing thoughts and information to help whet our appetite ahead of the conference. Talking of appetite , wonder if Lloyds have any good ice cream companies among their clients? Back again with my sector series based on the new CR Sector Reviews from CorporateRegister.com . Previous posts in this series include the Forestry and Paper Sector and the Automotive Sector. The CR Sector Overview series covers 11 sectors so far and they are free to subscribing members of CorporateRegister.com but I have kindly been provided with a full set, so that I can share some of my own insights about each one with the CSR Reporting Blog readers. Some context about the mining industry from the CorporateRegister.com CR Mining Sector Review: The mining sector extracts valuable minerals from the earth. Among the most common products of the mining industry are coal, gold, bauxite, copper, salt, iron ore, zinc, diamonds, lead, silver, clay, and limestone. Extraction of these raw materials takes place either through surface mining or underground mining, although the former is nowadays far more commonplace than the latter. Surface mining, including quarrying, generally consists of stripping away layers of topsoil and bedrock to reach ore deposits, while underground mining is classified according to the type of access tunnels used – shaft mining for vertical shafts, drift mining for horizontal tunnels, or slope mining for operations with diagonally sloping access shafts. The mining sector can be a highly profitable business: the top 40 largest companies had revenues of more than $700 billion in 2011, on which they made combined profits of $133 billion, according to PWC. Total assets of the top 40 amount to more than $1 trillion. The International Labor Organization estimated that in 2010, 1.5 million people were employed in the sector in developed nations, and 2.2 million in developing and emerging nations. The review lists six top material issues for this sector, with five more issues high on the radar. Among these top 11 issues are, as you might expect, are health and safety, remediation, and general environmental impacts. One of the most well-known bodies that drives ethical behavior in this sector is the Extractive Industries Transparency Initiative which publishes the global transparency standard for improving governance of natural resources. As usual, I'll take a look at the top five reports from this sector, which has tended to be one of the leading reporting sectors in all industry, ranking in the top ten of all sectors. The top five miners all published GRI A+ level reports in 2013 with 542 pages of scintillating content. Benefit of the doubt, please. Although, Glencore Xstrata was a runner up in the 2014 Public Eye awards, which give recognition for irresponsibility and unsustainability, and Vale won a Public Eye ward in 2012. Rio Tinto won Greenwash Gold's award in 2014, BHP Billiton has a website devoted to monitoring its activities by stakeholders who are concerned about its impacts. South African miners who developed tuberculosis working in gold mines recently won a landmark payout from Anglo American. If any sector needs sustainability reporting, it's this one. BHP Billiton was one of the early users of the GRI Framework, having published a first environmental report back in 2001. The current 2013 Sustainability Report is a GRI A+ 59 pager. What's good about this is that the page in which each issue is covered is indicated, so that you can link focus areas with the report narrative. What's less good is that there is no prioritization so we are left guessing as to what is considered MOST material by BHP Billiton and its stakeholders. Health and Safety: With 128,000 employees and contractors, health and safety is an area of significant impact for this company. BHP Billiton covers this in two separate sections: workplace safety, and health and wellbeing, the latter being about controlling occupational exposures at their source and providing a healthy work environment. Health risks faced by BHP Billiton employees "include fatigue and occupational exposure to noise, silica, manganese, diesel exhaust particulate, fluorides, coal tar pitch, nickel and sulphuric acid mist". In FY2013, the incidence of occupational illness was 47.9 cases per 10,000 employees, and this includes in increase in muscoskeletal diseases which may be caused or exacerbated by single or recurring incidents of "manual handling, heavy physical work, fixed work postures, sedentary work, frequent bending and twisting, lifting and forceful movements, repetitive work and vibration." Safety record has been improving over the past few years, but in FY2013, BHP Billiton records a total recordable incidence frequency of 4.6 per million hours worked, and three work-related fatalities. An interesting aspect of employee safety is aviation risk. BHP Billiton moves over 450,000 people each year by chartered aircraft so this is quite a significant. BHP's reporting in this area is mainly about addressing risk, rather than understanding opportunity. However, in Chile, you can take a moment out of your day to undertake "gentle stretching exercises". Maybe I should try that myself. Remediation: Called rehabilitation by BHP Billiton, this report goes into no detail about what this company does to remediate areas which the company has exited. There is a general statement: "The rehabilitation of land no longer required for our activities continues to be a central part of our approach to managing our effects on land. We are required to rehabilitate disturbed areas consistent with the pre-disturbance land use or alternative land uses developed in consultation with stakeholders." What has been done in FY2013 is not clear, despite performance data showing over 43,000 rehabilitated hectares in FY2013. Environmental Impacts: BHP Billiton focuses on climate change and energy, biodiversity and land impacts and water management. Environmental performance data is summarized on two additional pages at the end of the report and covers only this year and prior year. Given this company's long reporting history, we might have expected to see some trend data over a longer period of time. Emissions are higher in FY2013 than every year since 2010, but this doesn't prevent the CEO from claiming "In FY2013, our GHG emissions were lower than the FY2006 baseline, which keeps us in line to achieve our target of maintaining our future FY2017 greenhouse gas emissions below FY2006 levels." Some form of intensity measure linking emissions to output would be helpful in understanding whether BHP Billiton is actually making progress or otherwise. Also, BHP Billiton devotes a page to explaining all about fracking (hydraulic fracturing) which has been the subject of quite some controversy. While the depth of the protests against fracking appears rather understated (see a Telegraph article from August 2013), BHP has done the right thing by disclosing its approach and policy in this respect. Vale SA of Brazil, the worlds largest iron ore producer, produced a mammoth 218 page GRI A+ Sustainability Report for 2012, with a super-navigable hyper-linked PDF which is a pleasure to work through. Vale's reporting style is direct, if not a little technical, and data is presented clearly. Material issues are clearly laid out by Vale, although the two most material issues - communities and people - are very broad and could cover a host of related issues under these generic headlines. None of the Vale material issues are particularly sector specific. Health and Safety: Of the 195,000 people employed by Vale, an injury rate of 2.8 per million hours worked is recorded, as well as the fact that 15 families suffered tragedy through employees who lost their lives at work in 2012. Injury rates decreased in 2012 versus prior years, and in 2012, safety became an explicit element of employees' performance reviews. Prior year data of fatalities is not provided so I checked back to the 2012 report and there were 15 fatalities in that year too, and 11 in 2010. Seems that Vale has a long way to go to achieve its zero harm target. Remediation: This topic doesn't appear specifically in Vale's report, through a lot of narrative is devoted to biodiversity and land use, and the work Vale is doing to restore forests, and protecting speleological heritage. Gotcha. Speleogy is the study of caves. I learn something new every time I read a Sustainability Report. Vale has been doing some interesting speleology stuff. Vale has a program of closure plans to identify and plan to address social, environmental and geotechnical impacts. Environmental impacts: Vale's environmental impacts focus on land-use, climate change and energy, water and waste. In 2012, Vale generated one million tons of waste of which 97% was hazardous - 70% more hazardous waste than in 2011 - of which just over half goes to landfill and the rest is reprocessed or treated. Although Vale refers to plans to reduce generation of hazardous waste, results are trending in the opposite direction. In terms of GHG emissions, Vale has a target to reduce GHG emissions by 5% by 2020 (not sure what the baseline year is), and while Scope 1 and 2 emissions are lower than the 2010 level, they increased in 2012 versus 2011. Lack of intensity measures means that it is difficult to assess the underlying carbon management performance of Vale. RioTinto's Sustainable Development Report for 2012 is online and the PDF download is a website copy of 93 pages. Material issues are shown in the following chart with 13 issues highlighted as most material. Material issues are stated in generic headline terms, with no sector specific orientation. Rio Tinto has a set of strategic goals and specific, measurable targets, which more or less align with these material priorities. Health and Safety: Rio Tinto devotes much space to reporting on health and safety and record an accident injury rate of 0.67 per 200,000 hours worked. If my math is correct, this equates to a rate of 3.35 per million hours worked, a measure more frequently used. Fatality levels have decreased over the years to two in 2012, and data is shown since 2003 in interactive charts (for all key performance data) which is a benefit of the online presentation. Remediation: Rehabilitation is dealt with in detail by Rio Tinto and more interactive charts show the level of rehabilitation of land by type (agriculture, forestry, recreation etc). Rio tinto also has an internally developed Land Use Stewardship Standard to govern its activities in this area. Environmental impacts: Rio Tinto has been controlling energy consumption and emissions and includes intensity measures in its reporting so we can see that underlying performance is improving in most areas. Anglo American's Sustainable Development Report for 2012 includes a list of material issues presented on a full page with links to more detailed narrative and performance. Five years of performance data is provided in a separate section in the report. The seven issues highlighted are compliance, community, human rights, water, climate change and energy, employee health and safety and workforce management. Health and Safety: Anglo American reports a lost time injury rate of 0.6 per 200,000 hours across its 85,763 employees. In 2012, 13 lives were lost in work related incidents (and an additional 5 in public transportation and criminal incidents). The good news is that fatality numbers have been reducing since 2008; the bad news is that in 2008, there were 27 fatalities, an outrageous number of people killed during the course of their work. Anglo American may be getting safer, but tell that to the 13 families that suffered tragic losses in 2012. Anglo American says "We do not accept that any employee or contractor should have to risk their life while working for us." Err, sorry, but they do accept it. Every year since 2008 between 27 and 13 individuals have not only risked their lives but lost them. Fatalities, as we have seen so far, appears to be a characteristic of the mining sector. I wonder what would happen if manager salaries (or even jobs) were linked to the number of fatalities? I don't see any company in the mining sector making that link explicitly. Anglo American also reports transparently on the tuberculosis incident rate - an occupational disease - and it surprised me to learn that 958 employees out of 100,000 had tuberculosis in 2012, including 667 new cases. Again, this is lower than in prior years, demonstrating progress in addressing this issue, but even so, it's rather a horrendous discovery. This is in addition to 170 new cases of other types of occupational disease. Remediation: Anglo American also engages in rehabilitation efforts and has a toolkit for mine closure planning. Of the 98,561 hectares of land that have been disturbed by Anglo American's mining activities, 17,903 hectares have been rehabilitated. I am not quite sure why there is a big gap between what was disturbed and what was rehabilitated - this is not explained. In fact, the entire issue of rehabilitation is rather skimpily covered by Anglo American, IMHO. Environmental impacts: Anglo American provides 3 year data, showing increases in energy and water consumption but slightly decreased in GHG emissions. Water is highlighted by Anglo American as one of the most material business risks, with more than 70% of the company's mines in water stressed areas. 60 projects for water saving were implemented in 2012, and Anglo declares a strategy to be water neutral at new mines by 2030. The Water Efficiency Target Tool is appropriately acronymed WETT. Nonethelקss, total water consumption has been increasing, so Anglo American has some work still to do in this area. Glencore Xstrata was formed in 2013 after a merger between Glencore and Xstrata, making it one one of the larger companies in this sector with over 150 mining and metallurgical sites and other facilities, employing over 190,000 people, with the products that get into pretty much almost anything you might find in your home or business or anywhere else you might be. The newly merged company generated revenues of $214 billion in 2012, turning it into the largest company in this sector. Glencore Xstrata's material issues are generally similar to those we have seen in the other leading mining companies, though human rights and license to operate are explicitly noted, alongside safety, environment and compliance. Time to turn that belief into a reality. Glencore Xstrata includes several pages of detail about enhanced safety procedures and incident reporting. Hopefully, 2013's report will show some improvement. Remediation: Rehabilitation is briefly covered in a couple of short paragraphs. With the size and scope of this company's operations, we might have expected to see greater detail on this topic. Environmental impacts: Water, emissions and waste (including hazardous waste) are the key areas reported by Glencore Xstrata, and some case studies provide insight into specific initiatives to manage impacts. Emissions increased in 2012, but overall water withdrawn (excluding agricultural activities) reduced. Overall, my review of the mining sector reports, very superficial though it is, has reinforced to me how complex these large business are and how many sustainability issues they must deal with, from the most basic, such as the safety of their employees, to the most specific, such local community grievances about anything from noise, to transportation to air quality and more. As a result, the sustainability reports tend to be rather dry and technical, with a lot of data, in general, presented clearly. I suspect, though, not being an expert in the sector, that there is also quite a lot that I miss. That's why the CorporateRegister.com Sector Review was helpful - highlighting some of the core issues the sector faces, and helping us understand where we need to be vigilant. The fact that tens of people are dying every year in the service of the mining industry leading companies has to be unacceptable, not to mention the amount of suffering caused to employees and their families through work-injuries - I did a rough calculation for these five companies at an average 3.5 per million hours injury rate, and got a result of almost 5,000 people injured every year in these companies alone, some possibly very seriously injured. Surely it's time we worked out how to make work safer? Similarly, environmental impacts are varied and significant. Hazardous waste levels are a little scary, and in many cases, despite declarations of environmental love, impacts continue to get negativer and negativer. The fact that the sector is one of the top ten reporting sectors enables us, at least, to be aware of these issues and ensure we keep this industry on its toes.